Just a few miles from the sea, Aglientu is located in an area dominated by granite, the landscape of which is marked by majestic rocks and green hillsides that slope down towards the sandy shore, characterised by lofty dunes and imposing cliffs. The 14-mile coastline is renowned for the beauty of its beaches and panoramas, but despite the considerable influx of tourists, large sections of it have remained utterly untainted. The name of the town derives from a Latin root meaning “white”, which also appears in numerous other local place names (“Montagliu”, “Agliacana”, “Frati Agli” and “Agliu”). Human beings have been present here since the early Neolithic period, as evinced by the discovery of stone tools dating from that time. Numerous nuraghi (tower-shaped Bronze and Iron Age stone structures), including Tuttusoni and Finucchjaglia, are scattered across the area, mostly on the coastal strip. 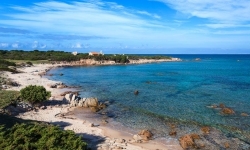 In the Roman period, Aglientu played host to a mansio (a station for changing horses), along the road the led from Porto Torres to Santa Teresa di Gallura. The current town can trace its origins back to 1776, when Victor Amadeus III commissioned the building of the church of San Francesco d’Assisi. A few decades later, close to the church, the so-called “kitchens” were constructed – these buildings were used for commercial purposes and for the staging of fêtes, in parallel with the religious ceremonies. Towards 1850, a number of wealthy families began to build residences for themselves, which ended up constituting the oldest part of the town. Originally a district of Tempio, Aglientu became an independent municipality in 1959. Numerous summer festivals are held in the town, attracting thousands of tourists from the coasts, such as the “Sagra delle Seadas”, the festival celebrating the typical Sardinian sweet based on cheese and flavoured with honey, which is held on the last Saturday in June, and the “Sagra della Salsiccia e del Formaggio”, the cheese-and-sausage extravaganza, held on 12 August. 25 January sees the celebration of Saint Paul of Lu Laldu in the country church of San Pancrazio, with the offering of local dishes to all guests, whereas 2 February is the date for the shared lunch in celebration of the feast day of Saint Blaise. 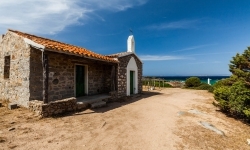 Leaving the road that connects Castelsardo to Santa Teresa di Gallura (at around 11 miles from the town), at the signposted fork take the short (800 metre) link road, until you reach Vignola Mare. In front of the small coastal settlement, you will see the beach stretching out, mostly to the east. With a short stroll to the left (westward), you come to the Torre Vignola (Vignola Tower), which looks over another beautiful bay, sheltered from the northwest wind. Further on, still on the coastal path, you come to the Cala di San Silverio, with its little church sitting in splendid isolation. Nearby you will find bars, hotels, restaurants, shops and various other facilities. Wild, solitary nature, on a large scale, envelops you to both east and west; underfoot you can feel the golden greyish sand, both fine and coarse; the green water is particularly deep here, and thanks to the extent of this tract of sea, it is never overcrowded. The beach is generally clean, with only the backshore subject to occasional detritus. A typical example of the fortifications used to guard the Sardinian coast, the Vignola tower dates from 1606, and is situated near the seaside hamlet from which it takes its name. The 12 metre-tall, truncated-cone tower is situated at an altitude of 25 metres above sea level, on a slight granite incline, and affords the opportunity to savour a wide-ranging panorama that takes in both the sea and the hinterland. There are numerous country churches in the Aglientu area. The oldest of these, dating from the late 17th century, is the church of San Pancrazio, located 3 miles from the town. 4 miles from the town, on the road leading to Tempio, there is the church of San Biagio, built in 1967 to replace a previous church; it plays host to a 15th/16th-century statue of Saint Blaise, carved by Sardinian artisans from a single block of pear wood. The church of San Giovanni dates from 1930, whereas the church of San Silverio was erected at the end of the same decade by the fisherfolk of Ponza near the Marina di Portobello, in a remote location close to the sea. 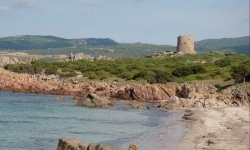 The most attractive feature of Aglientu is its coastline, where the extensive sand dunes create what looks for all the world like a desert landscape, alternating with towering rocky promontories, such as the rounded, pink-granite promontory of Monti Russu (90 m), which extends out towards the Gulf of Asinara. 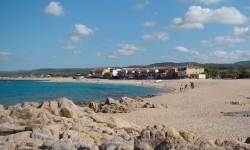 The longest beaches include Lu Litarroni, Vignola and Rena Majore. The church of San Pancrazio is located 3 miles from Aglientu. Dating from the 17th and 18th centuries, it is one of the oldest, most characteristic country churches in the western Gallura region. Legend has it that the church is the fruit of the devotion of a number of outlaws who sought shelter in the woodlands and rocky terrain nearby; for this reason, it is also known as the "church of the bandits". The church of San Pancrazio is an excellent starting point for treks on foot, mountain bike or horseback. The church of San Biagio is situated on a large green field, 4 miles from Aglientu, on the road leading to Tempio. 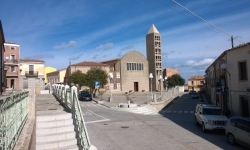 Built in 1967, it plays host to a wooden statue of the martyr St Blaise, created in the 15th or 16th centuries, almost certainly in Sardinia, from a single block of pear wood. A jewel of the local religious heritage, the church of San Silverio was constructed in 1938 on the initiative of a community of fisherfolk from the island of Ponza. Indeed, between the 1930s and '50s, many families from Ponza decided to settle along the coasts of the Gallura region and, in recognition of the warm welcome extended to them by the local populace, they built the church facing the fish-filled sea off Vignola.